Ever get that feeling when you are looking at something, but just can’t quite describe what it all means? I tie that same feeling into what is known as the Butterfly Effect, where one’s actions that may be ever so small can cause these ripples and affect the world around them. The term comes from a butterfly’s wings that may flap halfway across the world, but cause a raging storm on the other side. I think about the tiny ripples that have shaped who I am. Was it the small decisions that got me where I am today? The large ones? No, it is a summation of every collision, decision, and combination ever made that got me to where I sit right now. It is humbling in a way to think about life like that, where decisions or natural forces around you that you have no control over, can radically alter your viewpoint. As I look back and reflect upon the path I have taken thus far, I most certainly have scars to show for it. Those experiences shape you into who you are, whether it is right or wrong, good or bad, happy or distraught. The same scars you wish you had never received also help remind you of who you are, where you have come from, and hopefully some lessons learned along the way. As I look to the stars and continue to turn the pages in my life, sometimes I need to take a step back and appreciate what has been going on not only in the world, but in my own life. Laughing so hard that I almost peed my pants, the joys of love, the discovery of finding new music, it all comes with a price. That same high can give you those same lows, like drinking until you can’t remember what you were trying to forget, feeling lost in the world, or embarrassed by something you thought you were doing right. Each time I travel down memory lane, or look at those pictures from both near and long ago, an over arching theme comes through me. It’s like trying to summarize years of your life into one simple paragraph, or to capture so many emotions within a picture. It is so hard to do, yet as a human being I would love to capture it, to share it, so others can experience it in the same manner I can. Wouldn’t that be something? To be able to relieve an event through another person’s perspective. Hell, I don’t even know if I would like to relieve my own perspective sometimes, and if I could I don’t know if I would be the same person I am today. The same person that writes this, is not any different than anyone reading it. My hopes and dreams, aspirations for doing X, Y, or Z. Moments I wish I could forget, and moments that I wish I could hang on to forever. I certainly have mistakes that have cost me so much, yet I have opportunities big and small that I took advantage of and some how made something more out of it. It is with that mindset, that thought process, that brings me to the subject of this blog post. To capture a moment in time that I hold so dear to my heart, that represents more than I could ever describe, is what brings me to write here today. The picture above is shallow at first. It is simple. 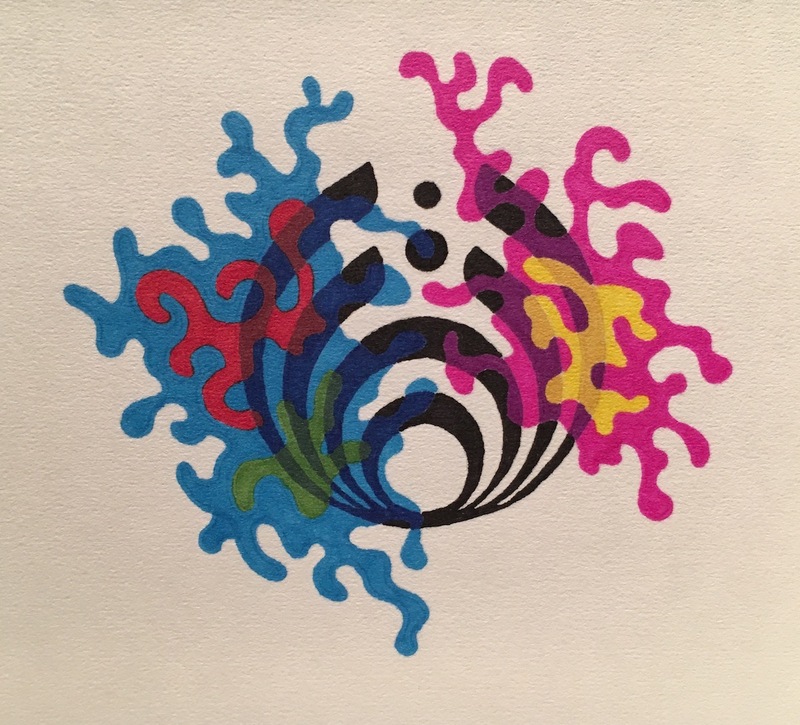 For those who do not know, it is a variation of the bassdrop symbol from my favorite artist, Bassnectar. Overlaid on top of the black symbol is a splash of color, and where the color overlays on top of the symbol it darkens, but is not quite black. Thus, it gives the illusion that the symbol moves all the way through the piece, in a similar fashion to my older DYSWIS drawing. But why the colors, why the symbol? Can’t you chose anything else in the whole world? Well, I certainly could try, but if you have learned anything from this post it hopefully is that there is always a deeper meaning than you originally thought. My journey through today offers me a unique perspective, a unique reason that I continue to flap my butterfly wings. I don’t know if I can ever convey the deeper meaning behind such a simple piece. “Oh, right Madison, it’s because you are an artist and you like Bassnectar, so it makes sense you would want that symbolism with you forever”. No, it extends beyond more than just the music, just the artwork. It is a culmination of a period of my life that I could only describe if you saw it through my lens. Through the hardship, the excitement, the triumphs and the failures, not even my own mother or my own spouse can truly understand it. In such a simple drawing, with all of its flaws and imperfections, it is something that I feel truly captures the adventures that this trial has given me. To take that perspective and to realize that I am not only influencing my own reality, but everyone else’s around me, is something that is humbling, downright scary, and enlightening at the same time. To be able to take my work, even just the artwork that is hosted on this website, and to be able to say that I am impacting someone else’s mindset is an amazing feeling. As with one of my core goals if I can influence the tiniest bit of positive change, a single flap of those small butterfly wings, in order to make the world a brighter place – I see no reason why I would not take that opportunity. To share a mental reflection, in the hopes that maybe someone, somewhere goes “You know what, I never thought of it that way.” and now they can’t help but to include that in their decision making process. I will have achieved my goal.